Why did Spindle fails and What Does HST do to Repair It? photographed the spindle next goes to our breakdown and clean area. Here the spindle is completely disassembled and thoroughly cleaned. a spindle may include cutting off seized nuts and pressing off rotors in our 100 ton press. Old paint is stripped off. All orifice and lubrication plugs are removed to get at minute internal passages that often harbor contamination. Scale and corrosion are removed from water jackets and cooling surfaces. Tapped holes are degreased, blown out and threads checked. 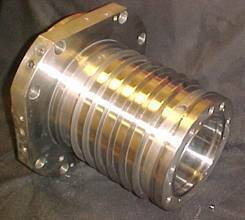 Every spindle component is thoroughly degreased prior to inspection.Bearings and other components are examined to determine the cause of the failure. This contamination was removed from a lubrication port. The spindle was recently repaired by a HST competitor. Not everybody is as thorough as HST. Our customers will probably never see the inside of their spindle cooling jacket like this Okuma unit (below). However, at HST they are cleaned until they shine. The surfaces inside the jacket are critical for proper heat dissipation. Any scale or corrosion not removed negatively impacts the thermal transfer coefficient causing spindles to run hotter. Running hotter increases the likelihood of premature failure. (L): Spiral cooling fins on an Okuma housing. R): The customer only sees the fresh epoxy paint on the outside cooling jacket. But the housing inside sparkles. After cleaning, the components are moved to one of our examination benches.Because extreme accuracy is required, dimensional examination is conducted in an environmentally controlled clean area. All instruments used for measuring are calibrated to a certified set of gages just prior to each examination. 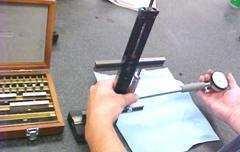 Calibrating a bore gage prior to housing examination.